Caring for an older loved one can be emotionally, physically, and financially draining if you don't know where to turn. 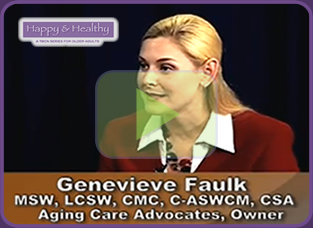 Our geriatric care managers have extensive knowledge about the costs, quality, and availability of health care and community services in the Tampa Bay, Florida area. We provide geriatric care management services throughout Hillsborough County, Hernando County, Pinellas County, and Pasco County, FL. HILLSBOROUGH COUNTY: Apollo Beach, Balm, Bloomingdale, Brandon, Carrollwood Village, Dover, Fishhawk, Gibsonton, Lithia, Lutz, Mango, New Tampa, Orient Park, Plant City, Riverview, Ruskin, Seffner, Sun City, Sun City Center, Tampa, Temple Terrace, Thonotosassa, Valrico, Wimauma, Ybor City, etc. HERNANDO COUNTY: Aripeka, Bayport, Brookridge, Brooksville, Garden Grove, Hernando Beach, High Point, Hill 'n Dale, Istachatta, Lake Lindsey, Masaryktown, Nobleton, North Brooksville, North Weeki Wachee, Pine Island, Ridge Manor, South Brooksville, Spring Hill, Spring Lake, Timber Pines, Weeki Wachee, Weeki Wachee Gardens, Wiscon, etc. PINELLAS COUNTY - Belleair, Belleair Beach, Belleair Bluffs, Belleair Shore, Clearwater, Dunedin, Gulfport, Indian Rocks Beach, Indian Shores, Kenneth City, Largo, Madeira Beach, North Redington Beach, Oldsmar, Pinellas Park, Redington Beach, Safety Harbor, Seminole, South Pasadena, St. Pete Beach, St. Petersburg, Tarpon Springs, Treasure Island, Ozona, etc. PASCO COUNTY - Bayonet Point, Beacon Point, Dade City, Elfers, Gulf Harbors, Holiday, Hudson, Lacoochee, Land O' Lakes, New Port Richey, Odessa, Port Richey, San Antonio, Shady Hills, St. Leo, Trinity, Wesley Chapel, Zephyrhills, etc. 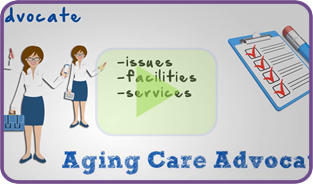 Aging Care Advocates services Hillsborough. Hernando, Pinellas, and Pasco County.